Greenhouses….they come in a variety of sizes, exist in varied climates, and contain all types of plants. 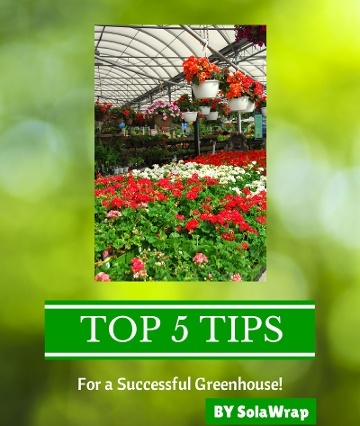 What are the Top 5 tips to better your chances of having a successful greenhouse? It starts with the cover. Introducing SolaWrap.…. SolaWrap Films is a unique greenhouse covering material that has been in Europe for over 30 years. Diffused Light: SolaWrap offers up to 83% diffused light. That makes it the only product on the market with both high transparency and a high diffusion rate. 10-year warranty against UV degradation: This film will not change color, get foggy or streaky. Water-tight and airtight: When used as a greenhouse roofing or walls, SolaWrap has withstood hailstorms, snowstorms and hurricane winds with both hot and cold snaps. Strong: Withstands up to 120 pounds per square foot of snow load = approx 15 feet of snow!